Let’s start with the answer for the wine quiz #69, grape trivia – Viognier. In the quiz, you were supposed to answer 5 questions about the white grape called Viognier. A1: Syrah. Viognier is allowed to be added to the red Syrah wines of Côte-Rôtie (up to 20%), and Shiraz Viognier wines are quite popular in Australia. A2: Château-Grillet. Château-Grillet is so called Monopole, as it is both an AOC and the single winery. Château-Grillet is known to produce some of the best, long living Viognier wines ever. Château-Grillet is surrounded by another Viognier-only appellation, Condrieu, which also makes great Viognier wines, but the answer I was looking for here is Château-Grillet. A3: Virginia! In 2011, Viognier was named an “official grape” of the state of Virginia. A5: There is almost always a slight element of controversy with all this DNA research data. According to DNA research information in Wikipedia, Viognier is shown “to be closely related to the Piedmont grape Freisa and to be a genetic cousin of Nebbiolo” – thus both Freisa and Nebbiolo are correct answers here. We had lots of great answers for this quiz, and we have winners! Considering the absolute precision on the answer for the second question (Château-Grillet), Jeff a.k.a. TheDrunkenCyclist is our Grand Winner today, but both Julian at VinoInLove and Kirsten at TheArmchairSommelier are also the winners of this wine quiz #69. Winners get their due share of unlimited bragging rights, but I definitely want to thank all participants – great job! I have few of mostly the reminders for you today. 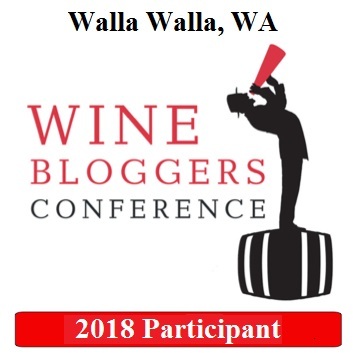 Today, August 14th – Wine Blogging Wednesday event, #WBW80 – Dry Rosé. There is still some times left to drink Rosé and submit your post! For all the details please click here. This coming Friday, August 16th – deadline for submission for the Monthly Wine Writing Challenge #2, with the theme called Trouble. You can find all the rules here. There is still time, get your trouble under control and write! Use #MWWC2 hash tag your submission. Tomorrow, Thursday, August 15th – Last Bottle 2013 Harvest Madness Marathon is taking place! If you like get great wines at unbelievable prices, this event is for you! Starting at 9 AM Pacific time, new wines will be sold at LastBottle web site at neck-breaking speed. Last Bottle model is similar to WTSO – no e-mail announcements, and they don’t even use twitter, so you have to refresh your browser all the time. There is one difference though – there are no minimum quantities to buy to get free shipping. The event will continue for 2 days, and all the wines will be shipped during few weeks after the event. If you are not buying wine at Last Bottle – you really missing lots of great deals. It is free to subscribe to their web site – but if you are not a subscriber and want to become one, send me an e-mail so I will subscribe you – you will get $5 credit (yes, true, and I will get $20, but then of course you can subscribe someone else…). Last but not least for today is an interesting article by W. Blake Gray which caused my quick and short reaction – WTF?! Seriously? Here is a post in The Gray Report, where W. Blake Gray is talking about an article in Wine Spectator advocating the idea of … noting else but GMO wines! I might be over-reacting, but after reading this article I was split-hair close to canceling my subscription. Well, read it for yourself and let me know what do you think. That’s all I have for you for today, folks. 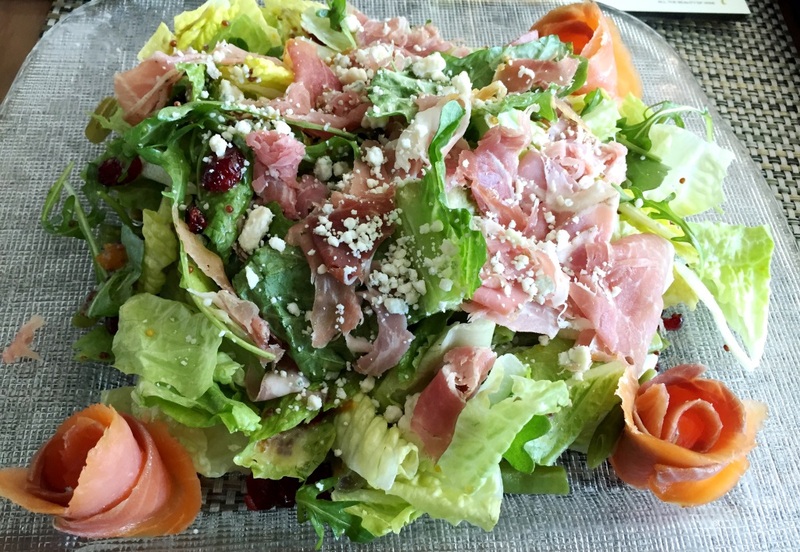 The glass is empty – but the refill is coming. 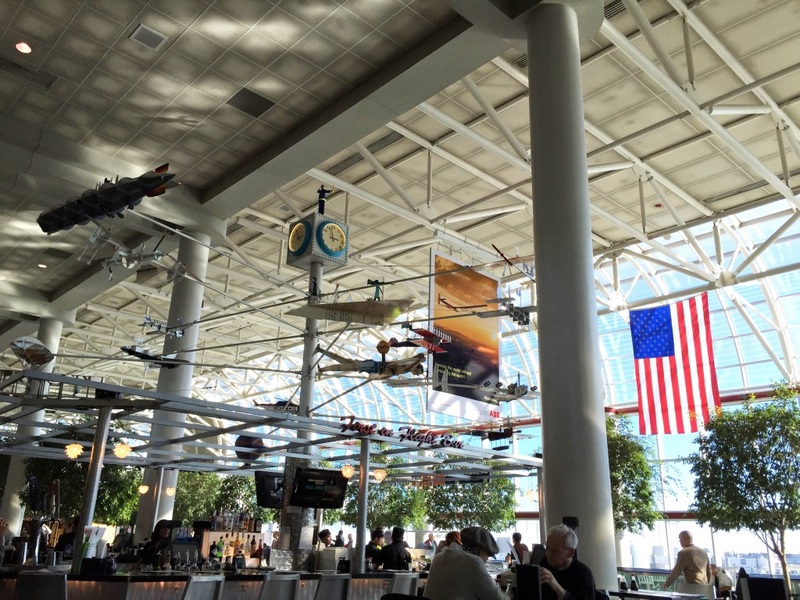 Until the next time – cheers! Battle of Viogniers: Texas Wins! One of the fascinating things about blogging is that you get to meet a lot of great people online. Moreover, you meet people who is passionate about the same subject as you are. And then, at some point, you can even meet those people in real life. This was my story Wednesday last week, when I met @SAHMmelier, who happened to live in Austin (you can find her blog here). As soon as we met, the feeling was that we knew each other for ages – it was so easy to start conversation (it was much more difficult to stop it later : )). Thanks to @SAHMmelier, I got a full embrace of the Texas wines, at the “Texas versus The World” meetup hosted by GUSTO Tastings, which we attended together. GUSTO Tastings does a great job of hosting multiple wine events every month, each one with a slightly different purpose. Each first Wednesday of the month, the members of the meetup get together for “Texas versus the world” event where the group gets to taste and compare wines made in Texas with similar wines made in the other countries and regions – this was the exact event we attended, and it was dedicated to Viognier (the November event will be all about Tempranillo or Sangiovese, which should be very interesting, as I think both of those grapes produce very good results in Texas – oh well, I will have to live vicariously through that one…). GUSTO Tastings also runs blind tasting events once a month, which are some of the most exhilarating experiences for wine aficionados. Anyway, if you live in a close proximity to Austin (or few other cities in Texas), you should definitely check GUSTO Testings out and use the opportunity to learn about the wines. Let me tell you now about the event. First of all, we had the best table in the town. We were lucky enough to meet and share the table with Flat Creek Estate winemaker Tim Drake, a witty and charismatic guy and his lovely wife Spring. In addition to all the fun conversations at the table, it was even more fun listening to Tim delivering his thoughts in bright and engaging fashion, with the ability to use very convincing expressions to emphasize his point (I will have to refrain from repeating his vivid answer and explanation for the question about Reserve wines). 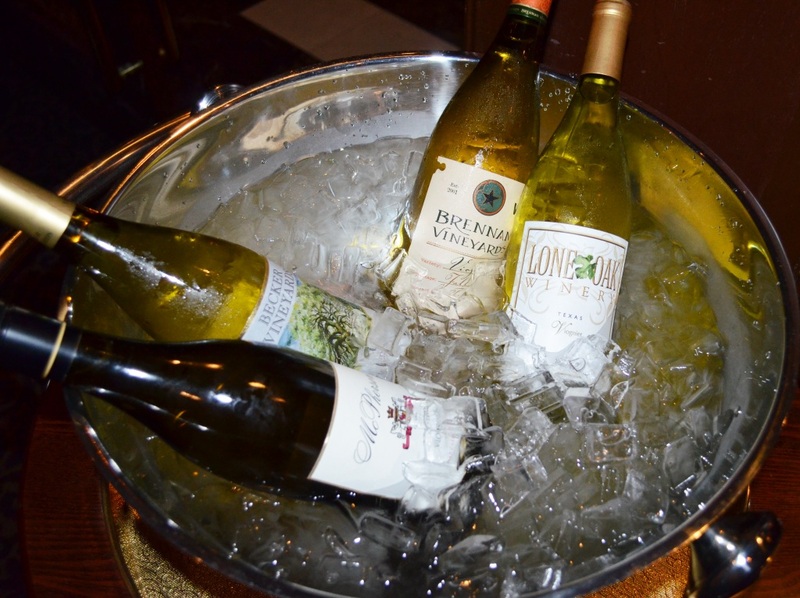 This particular event was all about Viognier, once nearly extinct Rhone white grape varietal. A few month ago there was a Wine Blogging Wednesday dedicated to Viognier, so for more details about the grape, including the link to the short video teaching you how to say that “Viognier” word correctly, here is the link to my blog post. 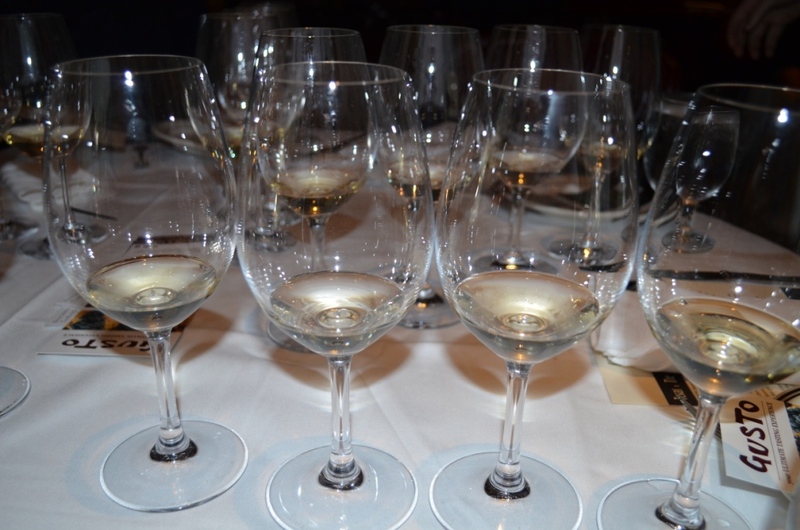 During the course of the evening, we tasted through 17 different Viognier wines – 8 from around the world, and 9 from Texas. All the wines where split into the flights of four, and the last flight had 5 wines in it. 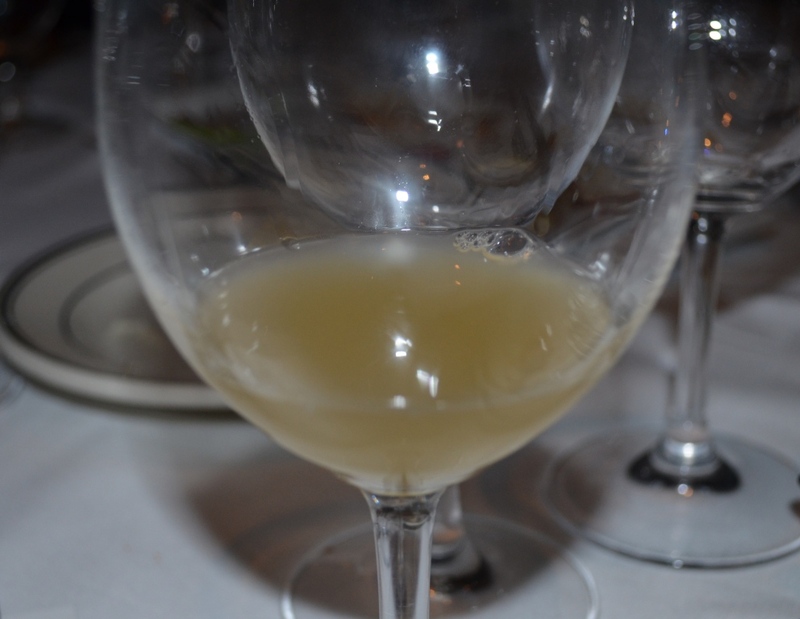 2010 La Capra Viognier, Western Cape, South Africa – somewhat green on the nose, with some matchstick. Let me stop here for a second, and I have a question for you, my readers. Have you ever experienced anything like that? Is that a showing of the extra sulfates used during the production? Anyway, let’s continue – there was also some minerality on the nose (or at least Tim suggested that it was) Pleasant on the palate, more of a Sauvignon Blanc qualities – lime, touch of grapefruit. As I was all puzzled by the nose, I’m not even sure how I want to rate this wine. 2010 Miner Viognier Oakville ’Simpson Vineyard’, Napa. Perfect nose – great bright fruit, nice perfume. Best nose so far. Palate doesn’t live up – kind of flat and unimpressive. Judging nose by itself this wine should get Drinakability of 8, but as a whole, I can only give it a 6. 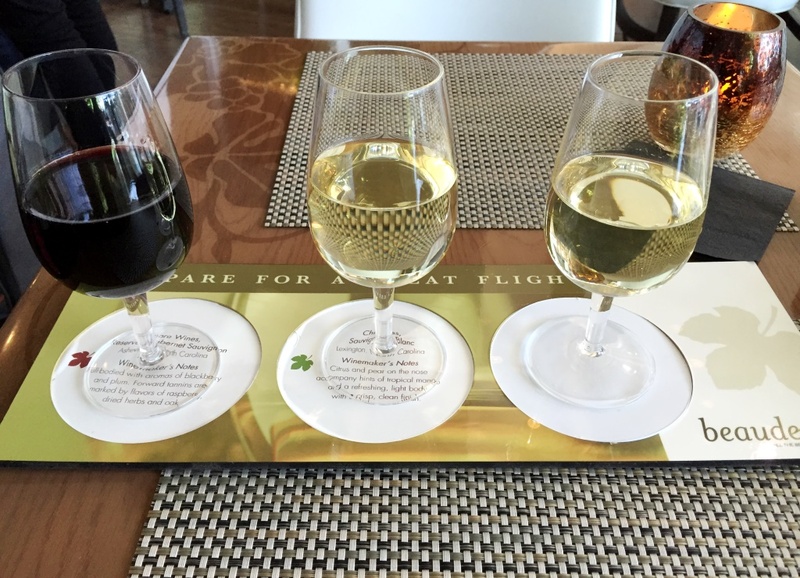 The next flight included a vertical of 4 wines from Flat Creek Estate Winery. As all of those wines were made out of grapes which didn’t grow in Texas (but the wine, of course, was made in Texas), they don’t carry Texas designation on the label. I have to admit that somehow I missed to take a picture of this flight, so just to give you an idea, I had to borrow the picture from the Flat Creek Estate’s web site. 2011 Flat Creek Estate Winery Viognier. Perfect nose. Bright, clean, nice white fruit. Outstanding, perfect acidity, ripe fruit, perfect balance. Lodi fruit. To this point, this was my favorite! Drinkability: 8. The fact that grapes were picked 6 weeks ago, and that Tim had blended wine in the morning of the day of the tasting, is just makes it an incredible experience all together. There you have it, folks – Texas makes great wines, so if you can get them – you should! And if your travel will take you down to Texas – make sure the wineries are part of your trip. You can tell them I sent you. Cheers! Viognier. 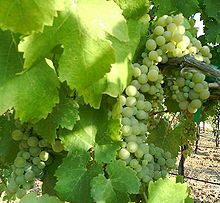 A white grape, with more than 2000 years of history, and nearly extinct by 1965 with only 8 acres of plantings left in Northern Rhone – for the full history of the grape you can refer to this article in Wikipedia. If you wonder why are we all of a sudden talking specifically about Viognier (after all, there are other 9,999 grapes supposedly growing in the world), the reason is simple. Yesterday was Wine Blogging Wednesday event number 78, hosted by Frank Morgan from Drink What You Like blog, and the event was dedicated to Viognier, which sprung back to life and now successfully grows pretty much all over the world. 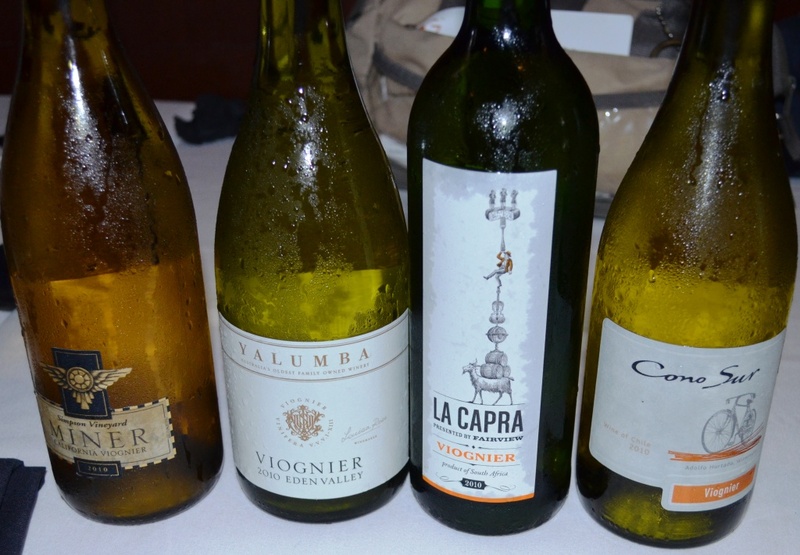 Viognier is no stranger on this blog. 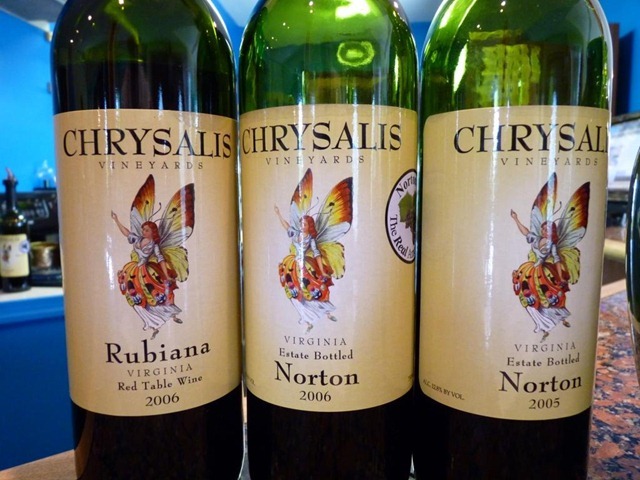 Two years ago, I was able to taste Virginia Viognier at Chrysalis Vineyards – it was very good. Then I had probably my best Viognier experience ever at the Lavinia wine store in Geneva – there I tried 2009 Domaine Georges Vernay Condrieu, a classic Viognier from Norther Rhone (it was outstanding with Drinkability rating of 9). For this WBW78 tasting I had a few prerequisites. For one, I would love to taste Virginia Viognier – but it is not available in Stamford, CT. For the second one, I knew that I don’t want to taste California Viognier. Why? First, about two month ago, I had bad experience at a number of wineries in Temecula Valley in California. Second, there some some advantages in writing this blog post somewhat late – you can refer to the work of others. Please read the description of Rosenblum 2008 Kathy’s Cuvee in the blog post by the fellow blogger Gwendolyn Alley, especially the last part: “…finishes tart and savory yet cloying”. No further comments. 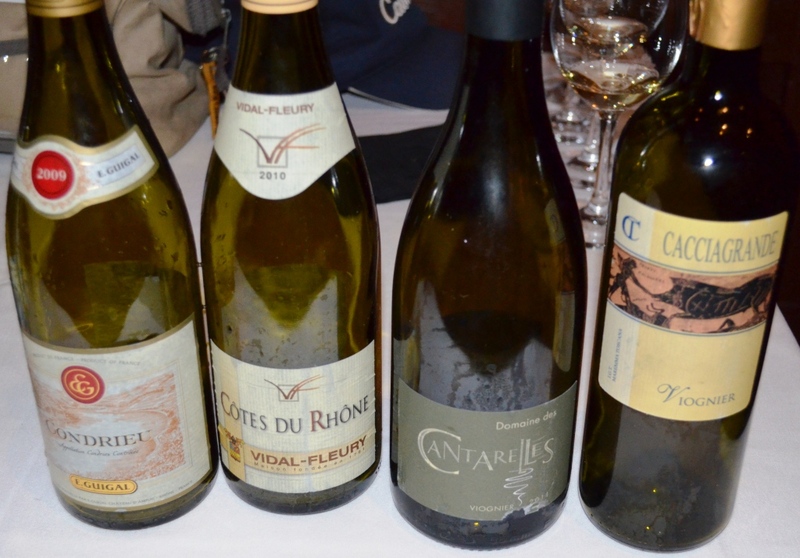 I definitely wanted to have classic Condrieu Viognier – but that is typically not a cheap option. Thanks to the advice of Zak from Cost Less Wines, I ended up with two bottles of Viognier – one from France, and another one from Australia. 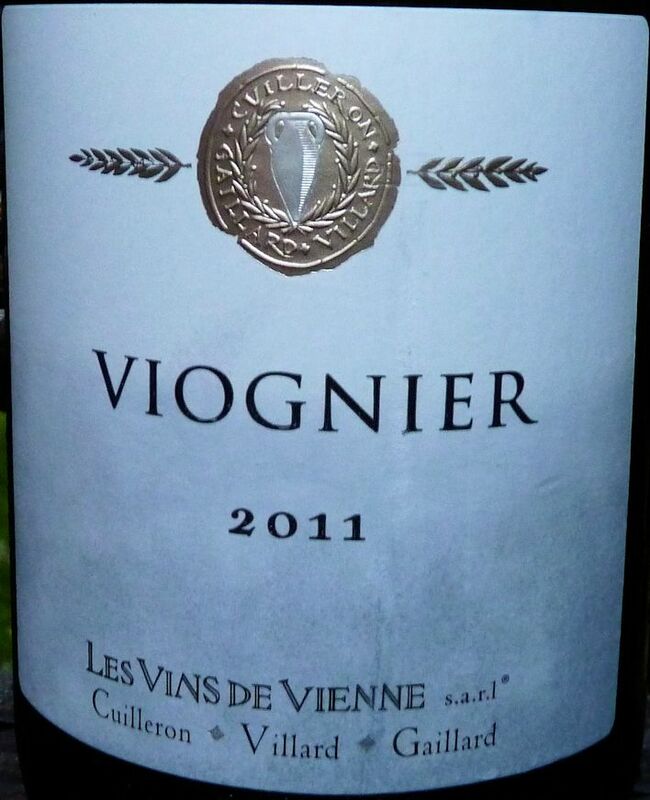 My Viognier #1 was 2011 Les Vines de Vienne Viognier ($19.99, 13% ABV). Interestingly enough, this wine was made in the region surrounding the town of Vienne in Northern Rhone region of France – one of the legends has it that this town (Vienne) gave the name to the grape itself (Viognier). Another interesting fact is that Les Vines de Vienne wines are product of obsession of the three wine makers – read more about it here. I didn’t plan any dinner or an event around this Viognier tasting, so I decided to pair it with a few random things I could grab from the fridge. But before we will talk about pairing, let’s talk about the wine itself. Here are the tasting notes “in progress”. Nice golden color, beautiful nose of green apple and orange zest. There is clean residual sweetness on the nose. One the palate – touch of sweetness, lemon tartness, golden delicious apple, perfect acidity. As wine opens up, sweetness disappears and acidity kicks in. Perfectly refreshing and balanced, very clean. Drinkability: 8+. Taking into account the results of tasting on the second day, I want to note that it is important not to over-chill this wine. Taken directly from the fridge on the second day, the wine had slightly unpleasant sharpness, a bite, which disappeared as soon as the wine warmed up a bit. As I said, the food pairings were rather a game than anything thought through and planned. I tried this wine with slow roasted Jalapeno ( our local Fairway had selection of large size Jalapenos, which were a killer after being slow roasted on a grill) – the wine was not enough to remove the heat of Jalapeno (fire hose was more appropriate for that). Wine worked very well with French goat cheese called Crottin de Champcol. It perfectly complemented grilled yellow squash and worked nicely with grilled asparagus. 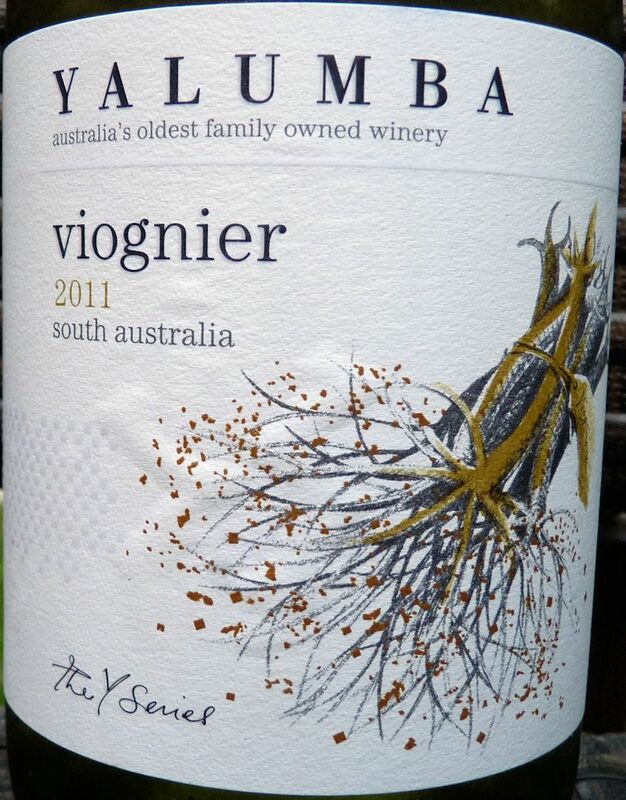 Viognier #2 was 2011 Yalumba Viognier South Australia ($11.99, 13.5% ABV). A touch darker in color than the #1, less bright. Nose of pear, herbs, white peaches and mango, more exuberant than the wine #1, but not to the point of being overwhelming. On the palate, there was more fruit than in the wine #1, but it was predominantly white grapefruit. While the wine was showing round enough, there was not enough acidity. Drinkability: 7. None of the previous food pairings worked well. With Jalapeno, the wine was showing very acidic. It was too fruity against goat cheese, and didn’t do anything to asparagus, and grilled squash was the only okay pairing for this wine. Still, I think this is quite reasonable wine for the money. This concludes my report about Viognier experience. I would highly recommend the Les Vins de Vienne Viognier – the wine is definitely worth seeking, especially considering that anything comparable and coming directly from Condrieu will cost you three times more. So, how about you? Did you have Viognier yesterday? I hope you did, and if you did not… what are you waiting for? You should be on the way to the store now. Cheers! Not sure if it will become a permanent feature on this blog, but I want to continue my short “wine news flash” posts on Wednesdays, and even came up with a fancy name for these posts, as you can judge from the title. First, an answer for the Wine Quiz #16, Father of California Wine: those of you who chose Junípero Serra were … absolutely correct! Under direction of Father Junipero Serra, Franciscan missionaries planted first sustained vineyard at Mission San Juan Capistrano in 1779, and subsequently, vineyards had been planted at another 8 missions. Those plantings had being known as Mission grapes, which dominated California wine industry for about 100 years. 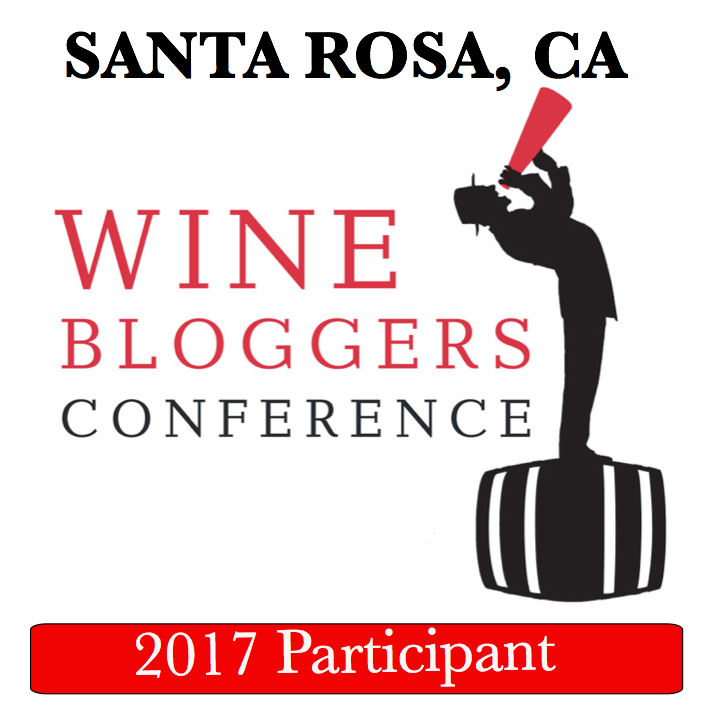 Today is a special Wednesday, which happens once a month in wine bloggosphere – it is so called Wine Blogging Wednesday. 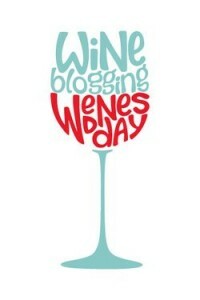 To be more precise, today is Wine Blogging Wednesday 78, or as it is abbreviated on Twitter, #WBW78. For 78 month in a row (if I’m not mistaken), special wine theme is selected for a third Wednesday of the month, and everybody are invited to participate and share the experiences. The theme for #WBW78 is called “Get yo Viggy On” (not that I personally like the way it is phrased), and it is dedicated to Viognier, a very interesting white grape originated in Northern Rhone in France. Viognier wines should be widely available – hope it is not too late for you to get a bottle and join the festivities. I plan to report on my experience later on tonight or tomorrow. For the rest of the interesting wine news, I decided to share only one note, which I came across yesterday, reading Tom Wark’s Fermentation wine blog (if you are not reading his blog – you are missing a lot). I know that some of my readers come from Canada, and I learned from this post that Canada is about to allow direct shipments of wine across provinces. As I believe US wine laws are arcane, I had no idea that Canada wine laws were even worse! I’m glad that this problem is about to be solved for Canadian wine lovers. That’s all I have for you for now, folks. Cheers! While traversing wine blogosphere, I came across a post about the book called “The Wild Vine” by Todd Kliman. This sparked my interest because of the two reasons – for one, it was talking about the grape called Norton, which was for a long time on my “to try” (of course partially due to the Wine Century Club and my Treble Journey). Another reason was that on the very first page the book was talking about Virginia, and Virginia already was set as my vacation destination for a coming week. To my full delight, Chrysalis Vineyards, located on Champe Ford Road in Middleburg, was the place where The Wild Vine book started, and it happened to be just around the corner of our intended destination in Virginia, which made visiting it very easy. When visiting wineries in some “well developed” areas, like Napa Valley in California, you usually drive along a big road, simply making turns into short driveways. Coming to Chrysalis Vineyards was pleasantly different – mile and a half on the narrow unpaved road, surrounded by luscious greens. Somehow you get this real rustic feeling, which sets you in the right mood for tasting the wines ( and probably affects the way wines taste, but I guess this will be a subject for another post :)). There was a great line up of wines at the winery. There were simply no wines which I didn’t like (has something to do with the road and right mood, huh? ), and all the wines were of a very good quality. The selection of grapes which are used at the winery also was very unusual – being accustomed to Cabernet Sauvignon, Merlot and Syrah from the West coast, and then Riesling, Cabernet Franc and Pinot Noir from the North East, seeing Viognier, Petit Manseng, Albarino, Petit Verdot and Tannat (and of course Norton), was exciting. The tasting included 12 wines, out of which 2009 Viognier (exceptionally perfumed and vibrant), 2005 Norton Estate Bottled (80% Norton with addition of Petit Verdot and other grapes, very balanced with silky tannins and long finish), 2005 Petit Verdot (80% Petit Verdot and 20% Tannat, very soft and round) and 2005 Norton Locksley Reserve (again, very balanced and soft) were really shining, I would rate them all at 7+ and 8 (Viognier definitely deserves an 8). All in all, if you have a chance to visit Chrysalis Vineyards – don’t miss it, go discover the Real American Grape for yourself – and let me know your opinion!